A tiny but powerful alarm for your menubar. Play a chosen sound (system sound, spoken by siri or recorded by you) some time in the future. Simple, no manual needed. Good for gaming, programming, not missing an appointment or timing the cooking of dinner so it doesn’t burn. Create alarms to use then with a click in the menu reactivate them anytime they are needed. All of the configuration is done using the status menu item. Clicking around should reveal just about everything there is to know about Tiny Alarm. Please download and give it a try. TinyAlarm will help you get exercise when at your desk for long periods, avoid missing your bus, burning your pizza, or showing up late for meetings. 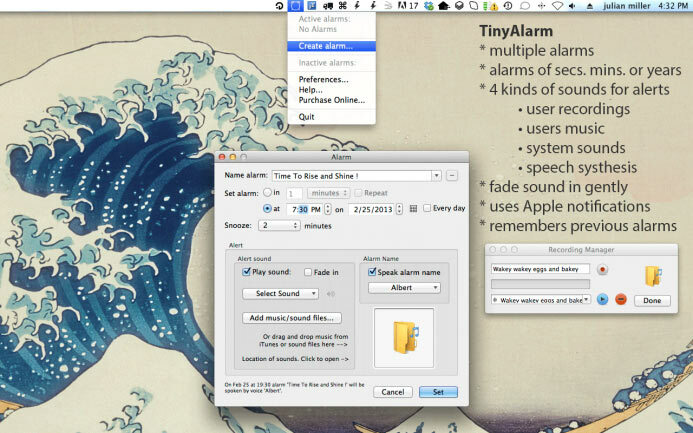 TinyAlarm requires Mac Intel and OS X 10.5 or later. TinyAlarm is shareware. After 30 days please purchase the software to support its evolution. - issue with alarm on next day fixed. - addition to menu of 'Take 5' start, stop and preferences. you may need to manually download this version and replace your old version. in future download and update will be easy. - improvement to time and date selection. can select days and other changes. - check for updates (sparkle) now works. keep the suggestions coming. thanks to all users. - sparkle will now do check for updates for future versions. - alarms and take 5, from our tinyalarm app, are now both in iclock. iclock is our app for everything having to do with time. it is a utility to help people manage time. - status/review report on alarm being set. - now has active and inactive alarms. inactive can be selected and used again. - added drop area for dragging sound and music from iTune or other applications. - Change prefs to report sound duration. - Added button in prefs to stop play sound. - Changed prefs to stop playing current sound, and play new sound. - Changed alarms so it stops playing sound when the alarm is cleared. - signed for 10.8 to meet apple's security guidelines. - compiled in the latest xcode. - is signed and with gatekeeper following apples security guidelines. - sound working now even when 'repeat until clear' not checked. 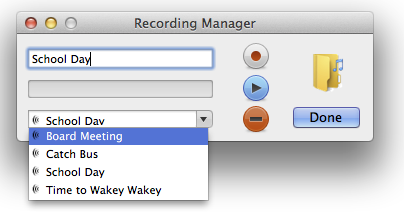 [Fixed] Added access to the iMovie sound effects (on every Mac) for alarms. TinyAlarm is a tiny alarm clock for your menu bar. It will play your chosen sound/music at some time in the near future. All of the configuration is done using the status menu item. Clicking around should reveal just about everything there is to know about Tiny Alarm. TinyAlarm is good for when you’re gaming or programming, but still have to get to class. It will also help you avoid missing your bus, or burning your pizza, or showing up late for meetings. TinyAlarm requires Mac OS X 10.4 or later. TinyAlarm is shareware. After 30 days of trying it out please purchase the software to support its continuing evolution. Purchase here to receive a license key. Open TinyAlarm to see this icon showing in the menubar. Click this icon to reveal the drop-down menu seen above. Most of the functionality of TinyAlarm is accessed from this menu. 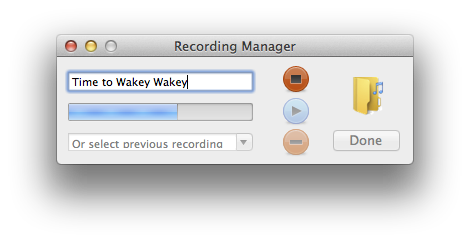 Choose ‘Create alarm’ to see the dialog below. Give your alarm a good name. Because TinyAlarm remembers your alarms you can choose it again in the future. This name shows up when the alarm goes off. It also can be spoken by the speech synthesizer if you choose that option. To delete a previously created alarm just select it from the drop down menu on the right side of ‘Name Alarm’ and hit the – (minus) button. Choose the radio button to either set the number of minutes/hours or to set the time/date. Click the little calendar icon to set the time/date visually with a clock and calendar. Then tap the ‘Set’ button at bottom right. Alarms can be set to go off in minutes or hours. Alarms can be set to go off each day at a certain time or on a particular day once. Once you create an alarm if you hit delete it is deleted totally. If you hit ‘clear’ then it remains in the ‘inactive’ part of the menu and instead of creating it again you can just select it. This is handy for alarms you use often. To add a sound alert to an alarm choose to ‘Play sound’ and/or ‘Speak alarm name’. 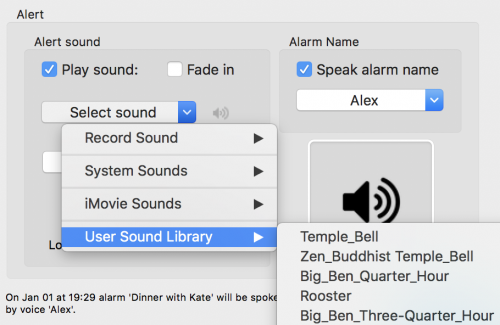 If iMovie is installed on your computer then iMovie Sounds seen above will show all the sounds in iMovie (a lot) that you can use in TinyAlarm. 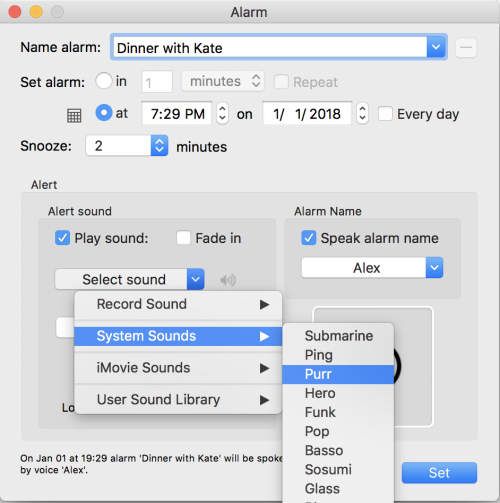 Record Sound allows recording an alarm sound. In the recording manager you give the sound a title then hit the record button to record a sound. Click the play button to play that sound or choose from the dropdown menu at lower left to choose and play or delete any song. Clicking on the folder icon opens the sound folder where you can add or delete any sound. System Sounds allows choosing from all the regular system sounds. Added Music/Sounds allows choosing from a folder where you have placed your own sounds. 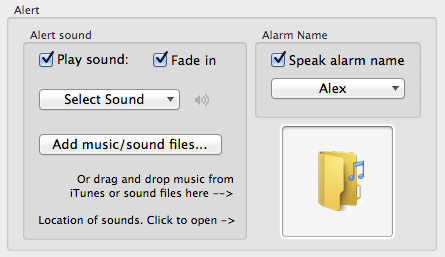 This opens a dialog that allows choosing a sound anywhere and putting it in the sound folder for TinyAlarm to use. Drag and drop sounds on the sound folder in the app or click on the folder (shown below) to open the sound folder. You can drag sounds in or delete sounds or the recording from here. When the alarm goes off, you have the opportunity to click ‘Snooze’. This will reset the alarm to a short time in the future. 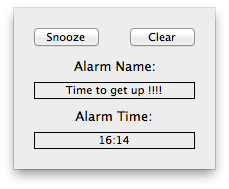 The default snooze time is set in the create alarm dialog. You can edit the list of alarms that are presented in alarm menu. Select the alarm and choose edit. Problem: People are spending a vast amount of time sitting, at the computer, in front of the tv, driving cars and playing video games. Sitting is fine but our devices are so charming that hours go by and we don’t move a muscle. Solution: Take 5 reminds you to take the break your body needs. Select the time between breaks, the duration of a break and the duration of breaks. Choose sounds to start and end an approximately 5 minute break. Get up and move around do some yoga, chores, push-ups, burpee, surya namaskar or take a walk the wife and kids. Whatever you enjoy that gets the blood moving again and relaxes you. TinyAlarm and iClock are your reminders to take 5. The Pomodoro Technique is a system of time management and one of it’s techniques is use of a ‘Pomodro Timer’. This has been found to help people make the most of the time they have for work. Taking a break actually helps people focus on the job at hand. Take 5 can also be used as a Pomodro timer. The default time in Take 5 is what is recommended in the Pomodoro Technique 25 mins focused activity and 5 min break but you can change Take 5’s settings to whatever fits your lifestyle. How to use – Set the ‘Break every’ and the ‘For duration’ and number of times these sets should repeat. Set sounds for the break start and break stop. Then hit ‘Start’. You can leave the window open to see the times or close the window and go by the sounds for starting and stopping breaks. 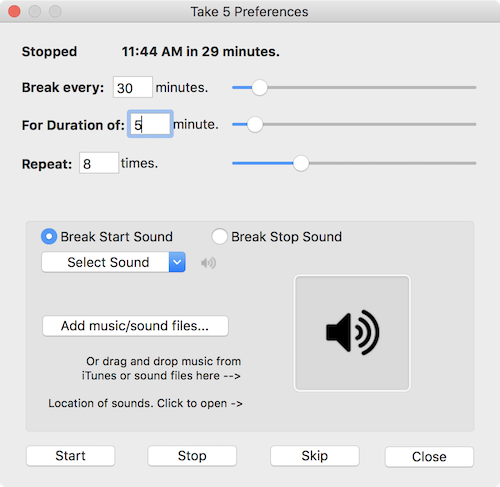 ‘Take Five’ makes a great sound to Take 5 in TinyAlarm and iClock because it is about 5 minutes long and is an excellent listen on your break. If you have the mp3 of Take Five then add it to the sound library in TinyAlarm and select it as the sound for the break. You can get it from Apple Music, Amazon, Google Play, YouTube and even here. Some more fun facts from Wikipedia about ‘Take Five’. Written in the key of E♭ minor, the piece is known for its distinctive two-chord[a] piano vamp; catchy blues-scale saxophone melody; inventive, jolting drum solo;[b] and unusual quintuple (5/4) time, from which its name is derived. Brubeck drew inspiration for this style of music during a U.S. State Department-sponsored tour of Eurasia, where he observed a group of Turkish street musicians performing a traditional folk song with supposedly Bulgarian influences that was played in 9/8 time (traditionally called “Bulgarian meter”), rarely used in Western music. After learning from native symphony musicians about the form, Brubeck was inspired to create an album that deviated from the usual 4/4 time of jazz and experimented with the exotic styles he had experienced abroad. Desmond, upon his death in 1977, left the performance royalties for his compositions, including “Take Five”, to the American Red Cross, which has since received combined royalties of approximately $100,000 a year. = total of $4,000,000 by 2017. The jazz piece was a tremendous contribution to music and just keeps giving. Your suggestions to improve this new feature are welcome. The preferences window seen below is in the shareware version. ‘Check for updates’ is in the shareware version and allows seeing if there is a new version. ‘Registration’ is also in the shareware version and takes you to the area to register seen below. 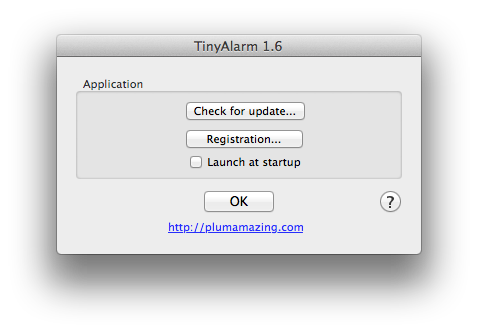 To automatically start TinyAlarm when you login, check the ’Launch at Startup’ checkbox. TinyAlarm can be tried out for 30 days. After that, please take your time and consider purchasing the program. 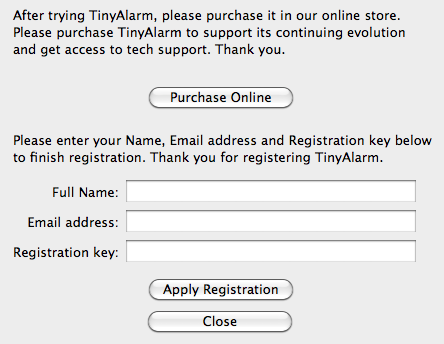 If you like TinyAlarm then your purchase helps push forward development to make the program even more useful. Purchasing quantities reduces the price in our store automatically. The knowledge that you are participating in the evolution of TinyAlarm. After purchasing you will use your email and a registration key to register. If you use Apple mail there is a link in the email you are sent that will register you automatically. To register manually copy and paste the info we send you into registration dialog (right) that is found in the TinyAlarm Preferences. If you have a suggestion, comments, bug or question please let us know by tapping here. The folks at Plum Amazing.